Saving your expenses/reports to a PDF and exporting data. 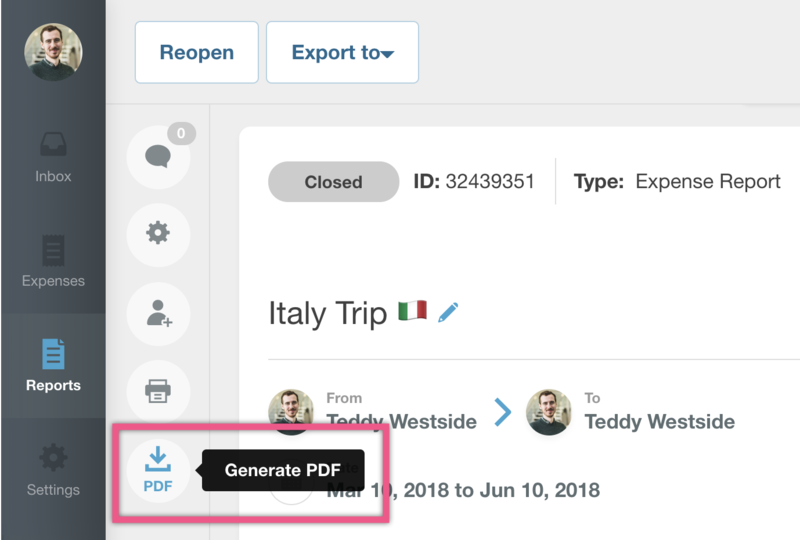 Expensify saves your data as long as you have an Expensify account, but the ‘Generate PDF’ option and exporting reports as a CSV offer added value. Both functions allow you to save, print, and back up your reports. A PDF will allow you to send your reports to others via email or to save them locally for auditing. Exporting as a CSV gives you the ability to export your reports to your accounting system or to review and sort your data further, outside of Expensify. Only reports with at least one expense can be saved as a PDF. In doing so, all of the expenses, any attached receipts, and all reports notes will be assembled in to a PDF file which can be sent to anyone or stored locally as a back up. You cannot download multiple reports to a PDF at once; this action must be performed for each report. We will prompt you to save the PDF somewhere on your computer. You can change the layout format of your report by clicking the wheel cog in the upper right corner of the report. There are two different format options available for organizing your report. 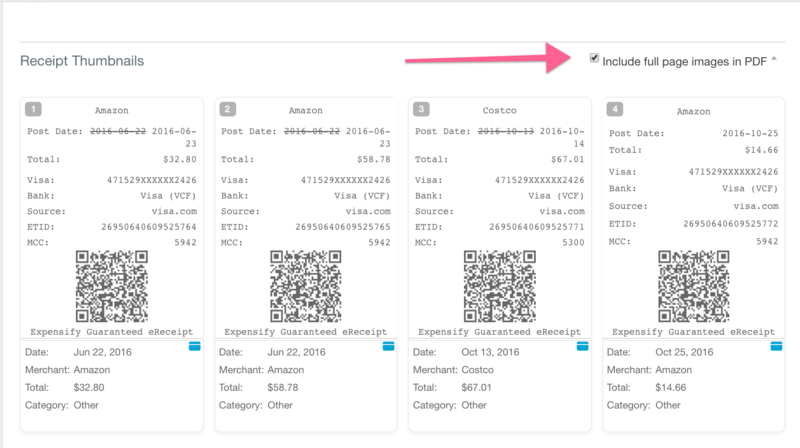 Single Table will display the expenses and categories in one table. 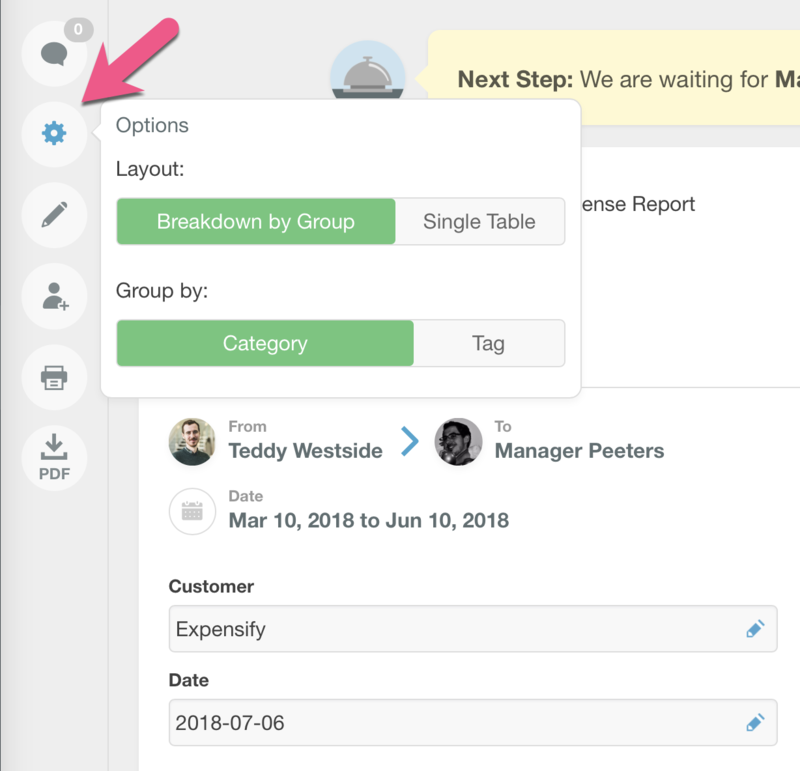 Breakdown By Group will sort the expenses into different tables by category or tag. This is useful if you have a lot of categories or tags that are taking up too much room in a Single Table display. Also, you have an option to check the "Include Full Page Images in PDF" box if you would like to have larger receipt images attached to the exported PDF. Just above the receipt image thumbnails at the bottom of a report you will see the check box for this option. Please note that large reports with a very large number of expenses may cause the PDF download to fail. In this case, you may want to uncheck the box for full page receipt images prior to exporting, or try breaking the report into smaller reports. 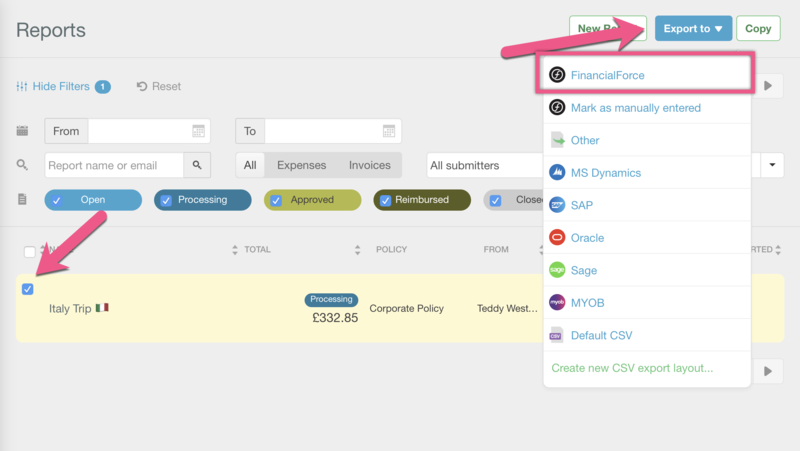 If your accounting software has been directly integrated with Expensify, you will be able to export directly from the Reports tab (if you are a group policy admin). Visit the specific help page for your accounting package to learn more detail on how to get this set up. Spreadsheets or CSV files are useful for moving your data out of Expensify, whether for your accounting package or to further review and organize data. 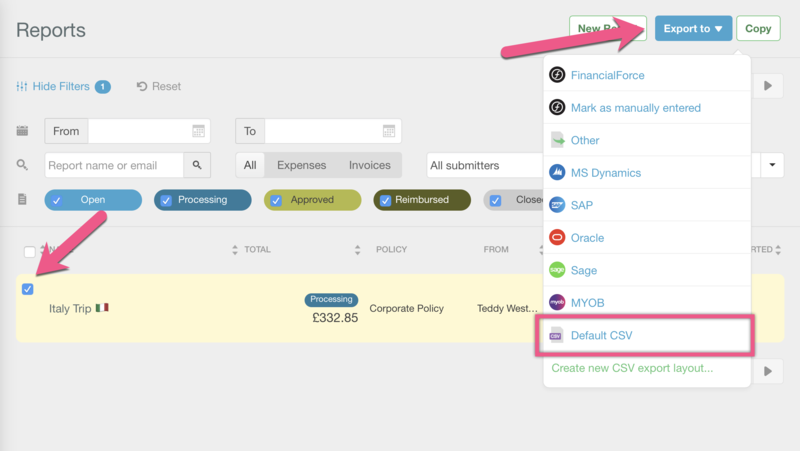 If you need to pick and choose just a handful of your expenses to export, you can trigger the export from the Expenses page. If you need to export entire reports, you can trigger the export from the Reports page. To do this, select the reports you'd like to export, click "Export To", and then choose the default CSV, or you can choose to create your own CSV export template. Need to create a template to export? To learn more about how to create a template to export, visit our reports export page.